Cannas add an almost tropical look to your garden with their large, bold ornamental banana-like foliage (which is either bright green, bronze, maroon or variegated) that is topped with somewhat orchidlike flowers on large spikes. Group them as accent plants (for vertical structure) in your garden or containers. There is a wide variation in heights among the various cultivars. If you do not want 5-6 ft/150-180 cm tall cannas look for the dwarf varieties under the series-names of 'Pfitzer' or 'Futurity' that grow only 3-4 ft/90-120 cm tall. 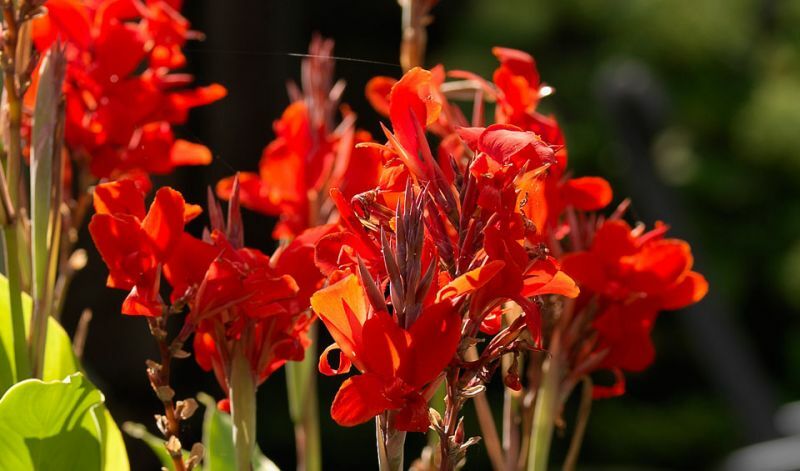 Cannas are low maintenance plants and their flowers will attract butterflies and hummingbirds. In flower beds, large borders and containers. 'Firebird' (red), 'Lucifer' (red, edged yellow), 'Pfitzer Primrose Yellow' (canary yellow), 'Pretoria' (orange, variegated foliage), 'Red Futurity' (red, burgundy foliage) 'Red King Humbert' (red, bronze foliage), 'Richard Wallace' (yellow) and 'Wyoming' (orange, bronze foliage).